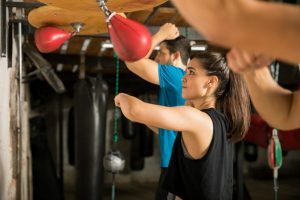 The first time you walk into a boxing gym, you may notice a lot of random bags hanging from the ceiling or equipment scattered about. It can be a bit overwhelming at first. Here is a quick guide to the boxing gym equipment you may see. The heavy bag is what it sounds like it is. It is a big bag that is typically very heavy and usually hangs from the ceiling by a metal chain. 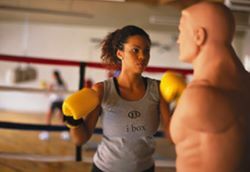 It is the primary tool for most fitness boxing classes. Lengths and weights can vary pretty significantly. 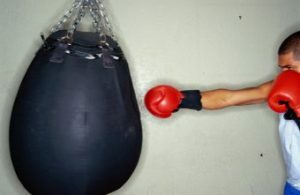 You should have to put in some effort to make the bag move when punching, but not so much effort that it feels like hitting an immovable brick wall. A teardrop bag typically hangs a little higher than heavy bags and is shaped like a teardrop with the largest portion of the bag on the bottom. This bag often moves a little more easily than a heavy bag and is often used to encourage using movement and angles. These are the thickly padded mitts that slip onto the hands similar to a baseball glove but flat on the outward facing side. They are used to receive punches during training. This makes it possible to practice combinations and movement on a moving target without direct impact to the receiving person. This is the small, noisy bag that is typically hung face level or a little higher. It requires steady and consistent hand movement to use, which helps build speed and hand-eye coordination. The way the speed bag is struck is not the way an actual punch is thrown. The mannequin in the corner that looks like an angry man with no arms or legs is Bob. This tool is used to promote accuracy in punches using a more lifelike target. Power punching is done on a heavy bag, but Bob is very helpful for technique. There may be a round ball that is roughly the same size as a small soccer ball attached to a string at both ends. One string is secured to the ceiling and the other to the floor. This is a double end bag. Don’t hit it really hard at first because it may hit you back. This is a great tool for practicing long-range strikes and footwork. There are plenty of other tools of the trade to be found in a boxing gym, but these are arguably the most popular. When familiarizing yourself with the boxing gym equipment, it is a good idea to watch how it is being used by other students and trainers. When in doubt, ask your trainer about the equipment. They may even give you some pointers along the way!